Holiday Housing Market a Gift to Buyers? 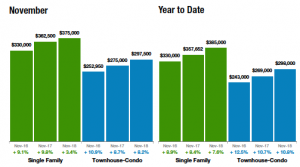 ENGLEWOOD, CO. – Dec. 12, 2018 – Despite the start of the typical seasonal and holiday slowdown in the housing market, median sales prices continued to tick upward while inventory supply and active listings continued to deliver mixed results in markets across much of the state in November, according to the latest monthly market trends data from the Colorado Association of REALTORS® (CAR). Conditions, which may be interpreted as either expected given the time of year, or potentially a market shift in the making, are creating a little less stress for serious buyers who may have just a little more time to consider their purchase without engaging in a bidding war. November also brought about a slight improvement (3.4 percent) in the CAR Housing Affordability Index from its all time low in October. The index, which CAR began tracking in January 2010, is a measure of how affordable a region’s housing is to its consumers based on interest rates, median sales price, and median income by county. “Tis the season or is it just for the season? The housing market changes will become clearer once we see what the spring market brings. However, for now, this market is a gift to buyers. Inventory is up 10 percent in Aurora over this time in 2017, and 20 percent over the active listing numbers in 2017 for Centennial. Home prices are up from 2017 approximately 6 percent in Aurora and 2.3 percent in Centennial. However, these annual increases are down from recent years. The median sales price in Aurora is now $360,000, which is lower than previous months in 2018. The median sales price for Centennial is currently $445,000, a year-over-year increase however, lower than previous months in 2018. There is no doubt we are seeing a more balanced market and days on the market are also up from previous months. “This is all positive for buyers with a new window of opportunity. Sellers need to study the market analysis done by their REALTOR® and price accordingly. All eyes will be on the February and March statistics to see where the market is heading,” said Aurora-area REALTOR® Sunny Banka. “Buyers are finally in the driver’s seat and enjoying every minute of it! November’s housing statistics show a strong, solid market in Boulder and Broomfield counties but on the street, there are price reductions and longer than normal days on the market. Buyers are loving the opportunity to think about a purchase, instead of rushing into a bidding war. These longer sales and lower purchase price numbers will likely show up in December and January’s housing statistics. “Boulder County homes enjoyed a healthy appreciation so far this year of 8.5 percent and with an average days on the market hovering around 45, it is still considered a seller’s market but with a more balanced, reasonable pace. Broomfield County has experienced a more modest appreciation this year at 5.2 percent but these homes tend to be more affordable than their Boulder neighbors and sell faster at an average of 31 days. Prices for attached units, however, have taken a dive and we are 6 percent lower than at the beginning of the year. This is not due to a weak market but instead, more affordable condos and townhomes hitting the market. “The price reductions and longer days on the market numbers will be represented in the sales in the next few months. The December and January numbers will tell a story if a correction will be made in this market or not and may help predict how the busy spring season will go,” said Boulder-area REALTOR® Kelly Moye. “The Pikes Peak Region continued to be strong in November, but it has softened. We’ve dropped 9.9 percent on the year-over-year sold listings and many local REALTORS® and lenders are feeling that impact. But from there, we really start seeing some positives. For the sellers, the median price range increased 5.5 percent for the year on properties overall and 7.7 percent for single-family residences. Even with an increase in overall active listings, properties continue to sell in just over 30 days, similar to November 2017. “On the buyer front, we got the good news that the Feds are re-evaluating the interest rate increases which then lead to lower rates at the end of November. With a slightly softer market, buyers would do themselves a favor to consider purchasing now with better interest rates. “I believe many are watching the stock market daily and the ups and downs have many anxious. Add to that, builders went from a very positive outlook to a more realistic outlook on the economy and therefore, fewer single-family homes are currently being built. With quite a few unknowns still out there, I think most continue to be optimistic, but cautious,” said Colorado Springs-Area REALTOR® Patrick Muldoon. “The Colorado Springs area housing market is still extraordinary, even with a 4.1 percent decline year-over-year in the year-to-date, single-family home sales. The month of November 2018 had the third highest number of single-family home sales, the highest year-to-date sales volume, and the highest monthly average and median prices compared to any month of November on record. On one hand, the increases in interest rates and prices are causing serious affordability challenges for buyers. Unfortunately, every 1 percent increase in the interest rate reduces the borrowing power by 10 percent for the same number of monthly payments. On the other hand, the improving supply is helping towards balancing the supply and demand situation necessary for a healthy real estate market. Year-over-year in November 2018, there was a 31 percent increase in active listings and a 54 percent increase in months’ supply. “In November 2018, the days on the market was 35 days, the months’ supply improved to 2 months, the sales price to list price ratio was 98.9 percent, and the percentage of active listings sold dropped to 50.9 percent from 76.4 percent last November. “Interestingly, year-over-year sales of single-family/patio homes priced under $500,000 plunged by 16 percent while the sales of homes priced between $500,000 to $800,000 increased by 12 percent, and the sales of homes priced over $800,000 soared by 100 percent,” said Colorado Springs-Area REALTOR® Jay Gupta. “’Is there a market shift or is it seasonal?’ A question many of us hear this time of year and the answer is a resounding, ‘yes.’ There are absolute signs that a shift is occurring while simultaneously, the traditional year-end cooling is approaching its floor. The median price in Denver is up 7 percent from this time last year to $465,588. While that statistic alone may not suggest a cooling, on the contrary, sometimes a single-year snapshot doesn’t always provide the story of a changing market. “During the transition from October to November 2016, the median price changed 104 percent, despite the seasonality. During the same timeframe in 2017, the price changed to 96 percent of the previous month and in 2018, the price month-over-month adjusted 89 percent. What this statistic shows us is that although we know less folks are in the homebuying market during the holiday season, in previous years this hasn’t significantly affected the demand and therefore the price. This year, however, despite a 7 percent increase in price over this time last year, the prices are indeed beginning to drop month-over-month which will in short time change the overall growth and or decline and provide a clearer picture of what our market has in store,” said Denver-area REALTOR® Matthew Leprino. “Prices seem to be stabilizing in spite of the 8 percent increase in median price. Part of what may be driving this increase is the overall reduction in number of homes sold year-over-year. Basically, fewer homes sold in the Fort Collins area this year compared to last year – but the prices of the homes sold has remained at the elevated rate created in the spring price run-up. “So in this season of giving – where’s the gift in these numbers? Buyers in this market are receiving the gift of time! With prices softening a bit, buyers have a bit more time to view the inventory of homes available. The slight uptick in month-over-month days on market shows that homes are still selling – but it’s taking a bit more time for them to sell. Buyers can use the additional time to actually compare properties against one another before writing a contract. “For sellers – pricing is critical! We’ve seen a lot of homes taking price reductions which tends to produce offers under asking price. If you’re thinking about selling speak to your REALTOR to find out if your home’s value has gone up – or leveled off. For sellers that need to sell quickly – an aggressive pricing strategy may still create competitive offer situations,” said Fort Collins-area REALTOR® Chris Hardy. “The mid and lower valley from Glenwood Springs to Rifle seems to be fairly balanced with new listings the same and solds up slightly over last year. The median sales price for single family was up 7.4 percent over last November with the average sale price up 3.6 percent, as days on the market and inventory continued to decrease. 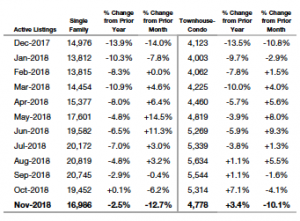 The median sales price in the townhome-condo market was down significantly (-17 percent) over last November, likely due to the inventory in this category being those units that are smaller and older than what was available last year. “The mid-valley area of Carbondale had the most significant increase in sales prices over the last year. The median sale price for a single-family home in Carbondale was up 44.6 percent over November 2017 to the tune of $940,000. The average sale price increased 37.5 percent to $1,032,682. While prices are the highest in Carbondale they do take longer to sell than their down-valley counterparts and close for a lower sale-to-list price. The inventory in Carbondale is also much higher than the down valley markets at 8.1 months compared to Glenwood Springs at 3.8 months and Rifle at 2.6 months,” said Glenwood Springs-areaREALTOR® Erin Bassett. “The holidays are here and the seasonal slowdown is upon us, but not for condos/townhomes under $300,000 in Jefferson County that continue to fly off the shelf! If they are in good condition, priced well, and have a sound location, these properties are continuing to receive multiple offers with bidding wars among potential buyers. Despite new listings up nearly 32 percent from last year, there are still not enough properties to go around. However, other measurements are not reflecting the same conditions. The median sales price has dropped from $266,500 last year to $265,000, while days on the market ticked up to 22 days from 20 this time last year, even with inventory increasing 1.1 percent, up more than 22 percent from last year. The townhomes/condos above $500,000 are sitting a bit longer. Unless they are in great condition and have a good location, we’re seeing price reductions in this category. “Looking at single-family homes, November has been busy too with days on the market dropping to 27. The medium sales price increased to $422,500 and new listings also increased to 494, a 9.5 percent uptick. “I still believe next year will be a softening market for sellers however, if interest rate takes another dive like they did this last week and remain low, the seller’s market is refueled once again,” said Jefferson County/Golden-area REALTOR® Barb Ecker. “Through the end of November, the Pueblo market had 2629 homes sold compared to 2700 at this time last year, reflecting a decline of 2.63 percent with low inventory as the primary driver of fewer sales. Our total dollar amount was up 5.63 percent for the market. When comparing the 2017 to 2018 markets, our homes sold were down 18 percent, but are only down 2.4 percent year-to-date. Pending sales year-to-year were down 5.3 percent, but year-to-date are down just 2.4 percent. Our average sales price is up just over 9 percent year-to-date with average days on the market down 15.7 so far this year to 70 days. “Overall, 2018 has been a solid year with a consistent need for more inventory. The 417 new construction permits pulled through the first 11 months of the year represent 56 more than the total number of permits pulled in all of 2017 and the coming year looks to be another strong year for construction. Interest rates and low inventory have slowed buyers a bit. We are getting closer to a neutral market, even though our average days on market, at 70, shows it is still a seller’s market,” said Pueblo-West REALTOR® David Anderson. “Royal Gorge area housing inventory for November continues to remain fairly stable. Custer County listings and sales remained fairly flat compared to the previous 2 months as the median home price fluctuated slightly lower to $210,000. “Fremont County’s new listings for November were down 14.1 percent from last November. 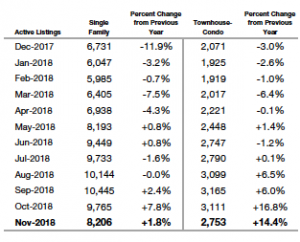 Year-to-date new listings are up 7.7 percent, however, year-to-year sales are down 4 percent, giving area buyers a bit more inventory to choose from. Fremont County’s median price increased by a healthy 14.7 percent in the last year. Statistically, both new and sold inventory in the Royal Gorge Region is at its lowest during November, December and January and we expect this trend to hold true these next two months. Days on the market in both Custer and Fremont counties has decreased slightly over last year’s marks. Yes, it is still a seller’s market, maybe just a little less stressful for our buyers,” said Royal Gorge-Area REALTOR® David Madone. “November sales brought the Telluride dollar volume above the five-year average, however, it is still down 10 percent from last year, largely due to lack of inventory. What is interesting is that the sales are spread out pretty evenly between the Town of Telluride, the Town of Mountain Village and the surrounding area subdivisions. Three of these sales were larger ranches above $3 million each. Lastly, the Telluride Ski Area was voted the number one ski area in the United States by Conde Nast readers for the sixth time in the last seven years,” said Telluride REALTOR® George Harvey. “November activity for the Valley was spectacular on the skiing front with both Vail and Beaver Creek opening early to super snow conditions. The Real Estate market maintained the trends of the past few months with transactions plus 0.04 percent and total dollars up approximately 8 percent year to date. The pending contracts were off at a traditional seasonal rate for the month of more than 20 percent which brings us to the end of our summer season closings. As we enter the winter season, listings are beginning to increase however, our 6.3 months supply of inventory is at a low point for all types of product for the year. 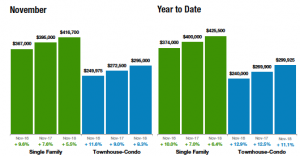 The market is split with single-family/duplex units trending up and condo/townhome units showing the same trend on the downside. “If the listing inventory continues to show increases and should the ski season bookings maintain their current pace, we look to a solid sales season. The inventory variances will be key for buyers and sellers to attain their objectives,” said Vail-area REALTOR® Mike Budd. The Colorado Association of REALTORS® Monthly Market Statistical Reports are prepared by Showing Time, a leading showing software and market stats service provider to the residential real estate industry, and are based upon data provided by Multiple Listing Services (MLS) in Colorado. The November 2018 reports represent all MLS-listed residential real estate transactions in the state. The metrics do not include “For Sale by Owner” transactions or all new construction.